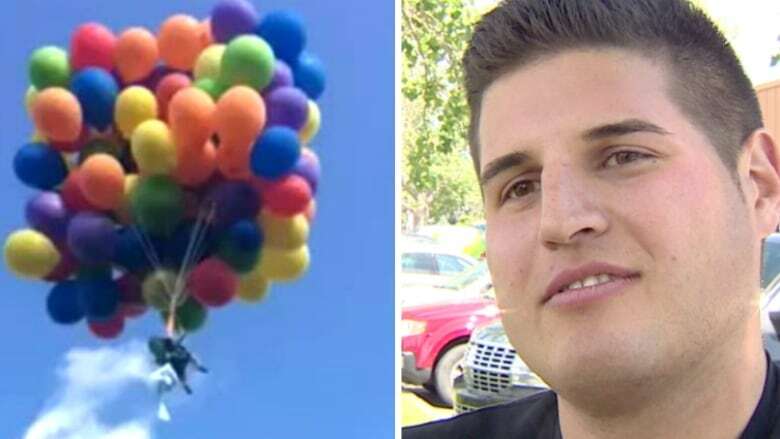 Two airplanes passed under Daniel Boria while he floated two kilometres above Calgary in a lawn chair tied to more than 100 helium balloons, court heard as he was sentenced to thousands of dollars in fines and donations. Provincial court Judge Bruce Fraser accepted a joint recommendation for a sentence of a $5,000 fine on Thursday, a day after Boria pleaded guilty to dangerous operation of an aircraft for the 2015 stunt. Fraser called it an "unusual case" and also accepted a recommendation Boria make a $20,000 donation to a charity of his choice. On July 5, 2015, Boria tied $13,000 worth of industrial-sized balloons to a Canadian Tire lawn chair and took to the skies in a stunt to promote his cleaning company. Boria's plan was to parachute into the Calgary Stampede chuckwagon races, but the weather didn't cooperate and high winds forced him to bail early. He landed on Ogden Road, where he was arrested by police who had been monitoring Boria since he was spotted above the Stampede grounds. Though he called Nav Canada Edmonton Flight Information Centre and Transport Canada in the months leading up to the stunt, Boria did not get permission to perform the stunt, according to an agreed statement of facts read aloud in court on Thursday. "Some have called [Boria] a balloonatic," said Crown prosecutor Matt Dalidowicz. Boria was last spotted in his lawn chair and balloon rig at about 2,100 metres, "well within the control zone above the Calgary International Airport," the statement of facts says. Even a full-grown Canada Goose — which only weighs about 20 pounds — can cause "devastating damage" to airplanes but Boria's contraption weighed up to 200 pounds, the document points out. "In a scenario where an aircraft traveling at 300 km/h makes contact with an uncontrollable object weighing 150-200 pounds, the results would be catastrophic damage to the airframe, engine and/or control surfaces." The cockpit windshields could be compromised with crew members potentially becoming "incapacitated," according to the document. "He's well aware of the danger he caused," said defence lawyer Alain Hepner. A Westjet plane arriving at the Calgary airport noticed a "whole bunch of balloons clumped together" but airport tower controllers had no way of knowing his precise location, the document says. Boria had with him an oxygen tank, a radio to communicate with his "ground crew" and a parachute when he took off from the Highland Golf and Country Club in northwest Calgary. During his time in the air, between 7:10 and 7:30 p.m., 24 airplanes took off and landed in Calgary. He sprained his ankle landing in an industrial field in southeast Calgary and found himself in trouble with the law. "I knew I would get arrested, but I didn't think they would pursue it as heavily as they did," Boria told CBC News last year. "I've never done anything wrong before and this was with good intentions." After the incident, Boria bragged to various media outlets about the stunt and emailed a friend to say he planned on breaking the high-altitude record the next year, trying to get to 42,672 metres. As part of his sentence, Boria must also surrender the footage he captured during the stunt so that he can no longer benefit from media attention. Calgary police initially charged him with one count of mischief causing danger to life.